Yamaha was an early advocate of series produced racers destined for privateers, even though the company did venture into works Grand Prix entries as well. Nevertheless, it remained true to the concept of the "client-competition" machine. For a long time, these famed bikes were developed using existing road-going machines as a basis. This was the case with the TD 250 and 350 models, but this relationship ended when Yamaha decided to adopt liquid cooling on its 1973 350 racer. The original TZ 350 was built in a run of 200 examples and won a number of events, likethe Daytona 200 and the Imola 200 (ridden by Saarinen of Finland), against a lineup of more powerful works 750S. In 1974, it was the 250's turn to gain liquid cooling. The favored mount of the privateers, the TZ Yamahas had a long and brilliant career on race circuits around the world. Overhauled by genuine works bikes in Grand Prix, they nevertheless long remained an important factor and the only means for an independent rider to hold his own. Jean-Louis Tournadre and Christian Sarron once again demonstrated the effectiveness of the TZ by winning the world 250 title in 1982 and 1984. But from the following season on, the proliferation of works racers loaded the dice against the TZ, which finished far down in the results. The day of the truly competitive privateers' bike was over. 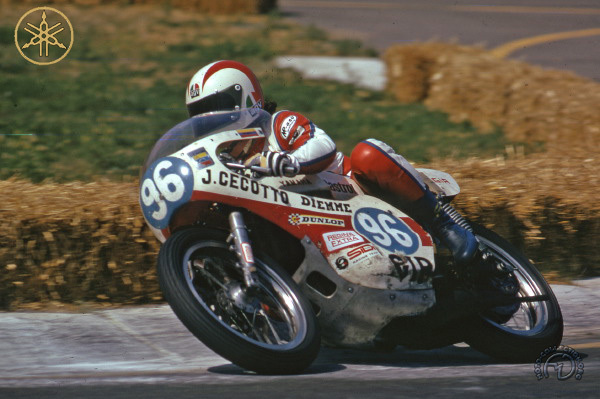 Many prominent riders of the 1970s, like ]ohnny Cecotto (seen here), cut their racing teeth at the controls of a Yamaha TZ.